The Chronicles Of Narnia - Prince Caspian (Hindi), a Hindi movie, is not currently screening in Hyderabad. 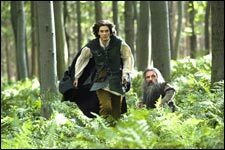 In Narnia, it has been more than a thousand years since the Pevensie children were Kings and Queens, in the first installment of the series, the fun but mouthful The Chronicles of Narnia: The Lion, The Witch, And The Wardrobe. Back in their world, Britain still has the Second World War to fight, and only one year has elapsed. Time, it is explained, moves differently in both worlds. fullhyd.com has 700,000+ monthly visits. Tell Hyderabad what you feel about The Chronicles Of Narnia - Prince Caspian (Hindi), and then also see all user reviews for The Chronicles Of Narnia - Prince Caspian (Hindi)!